Martha Berry thanks Mr Hall for his hospitality and kindnesses during her trip to receive a medal at a diner at The Waldorf-Astoria in New York. She expresses her appreciation and gratitude to The National Institute of Social Sciences for the medal and their consideration. 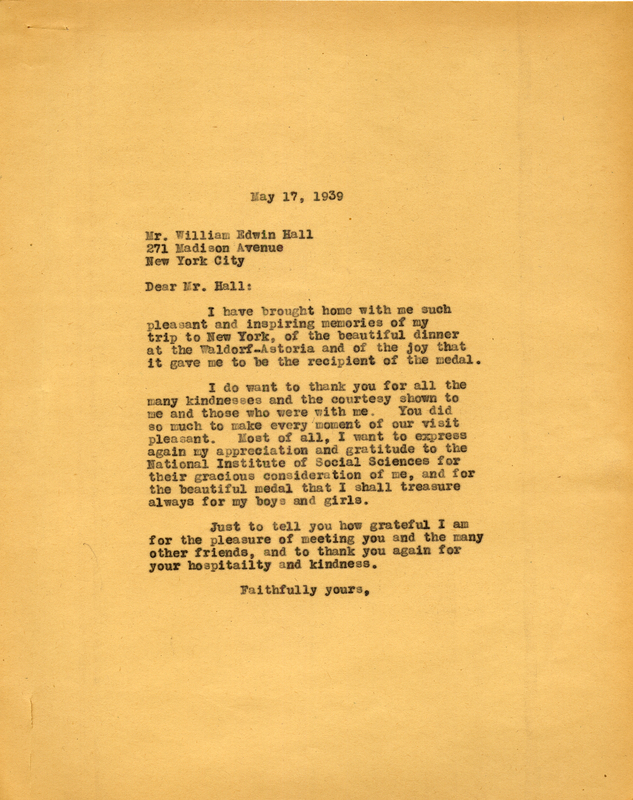 Martha Berry, “Letter to Mr William Edwin Hall from Martha Berry.” Martha Berry Digital Archive. Eds. Schlitz, Stephanie A., Alan Henderson, Jessica Hornbuckle, et al. Mount Berry: Berry College, 2016. accessed April 22, 2019, https://mbda.berry.edu/items/show/15066.